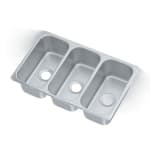 Vollrath 12065-3 (3) Compartment Drop-in Sink - 6.125" x 12.125"
(3) Compartment Drop-in Sink - 6.125" x 12.125"
The Vollrath 12065-3 vending cart sink is designed with a compact rectangular shape and three bowls. Each bowl measures 121⁄8 by 61⁄8 inches with a 5-inch depth and has rounded corners for enhanced sanitation, which helped this product earn NSF certification. It can be installed as a drop-in or stud mounted, as both a perimeter rim and mounting brackets come standard. 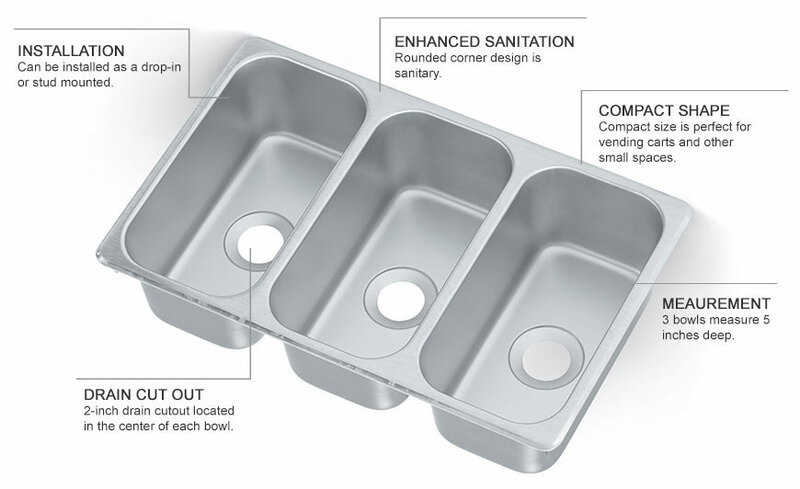 It is constructed from 304 stainless steel and has a 2-inch drain cutout in the center of each bowl. "The sinks are so flimsy they bend when you pick them up! Packaging isn't very good either... mine showed up with all 4 corners bent & it had a li..."
"This is perfect for my snow cone trailer!" "The sinks are so flimsy they bend when you pick them up! Packaging isn't very good either... mine showed up with all 4 corners bent & it had a little split between two of the sinks! Certainly not happy." "Perfect for my concession trailer!" "This little sink is perfect for our coffee cart. It looks very professional because it's NOT just 3 pans welded together as some others I looked at were. Plenty sturdy for our use. I'm just so glad to have found this for our tiny space."